It might not look like the luxurious travel advertised in glossy magazines, but there is plenty of adventure to be had riding across the country in an old, semireliable utility vehicle with practically no plan. Whenever someone asks where I’m from, I’m tempted to answer “on the road.” Usually, though, I say Denver, because some of my formative years were spent there and it’s often where we landed after some new city didn’t work out like we’d hoped. My family spent so much time traveling back and forth across the U.S. that I feel most at home on interstate highways. Our trips weren’t like the RV road-trips lifestyle of summer family-trip comedies, nor were they like the debaucherous find-yourself road trips of teen rom-coms. These travels with my family weren’t like the travel I read about in National Geographic or travel magazines. In fact, it wasn’t until many years later, not too long before I became the travel and outdoors writer at The Seattle Times, that I even realized that the time I’d spent on the road might be considered travel. When my family hit the road, it was in a brown-and-beige 1986 Chevy Blazer we’d named Betty. Usually, we’d pack the Blazer with whatever we could fit, including our two cats, and stash the rest of our belongings in a storage space or a friend’s basement. Then we’d set off for whatever destination promised a better life this time. We’d usually sleep in the car at rest stops, my 6-foot-tall brother cramped in the back seat while my mother and I reclined our front seats as far back as we could. We lived off of gas-station meals of cheese sticks and boxes of crackers for lunch or waxy doughnuts and milk for breakfast. Fries and Frosties from Wendy’s were a treat whenever we found a truck stop or rest stop with a fast-food restaurant attached. Typically, these travels were meant to be one-way trips to somewhere that would solve all of our problems. Or at the very least, we’d put 2,000 miles between us and whatever intangible nightmare we were running away from this time. We cut back and forth across the country and up and down both coasts to run from heartbreak, abuse, poverty, homelessness, gang violence and mental illness. Betty had 250,000 miles on it before the engine blew, just one year before my mother dropped me off at college in a new beater named ‘The Pickle’. But we weren’t always moving. Sometimes it was just a trip. There was always something significant waiting at the other end. We drove to L.A. and Minnesota because I’d found out that I shared a birthday with Naomi Campbell and my brother and I decided we wanted to get rich by becoming models. We drove to the backwoods in Texas so my mother could reconnect with her mother who was living in a school bus at the time. We drove from Colorado to Mystic, Connecticut, where my mother dropped my brother off at the front door of a house where she said the father he’d never met had lived. His father, it turned out, had passed away, but my brother got to spend a few hours looking over family photos with the grandmother he’d just met. Once, when we were 13 and 14, my brother and I traveled from Maine to Denver on a Greyhound bus by ourselves because we were supposed to move back to Denver. After a few months, our mother called us back to Maine, and we got back on a bus going the opposite direction. Whenever and however we took these trips, we did it on pennies, often arriving at our destinations on the mercy of the universe and gas bought with whatever coins we could scrape together from every cup holder and seat-cushion crevice in the car. This is how I learned to travel. At the time, I didn’t really realize it was traveling. And if the traditional travel magazines and stories are to be believed, it wasn’t. But these trips showed me how much more there was outside my little troubled neighborhood in Denver’s east side. I got glimpses of communities where the ways of life were completely different from what my entire experience had been thus far. When we first ventured farther into the Rocky Mountains than I had ever been before, I watched out the window as we passed by towns that fit into little valleys between the mountains, like the open palm of a hand, and I imagined what it would be like to live in a place where you could make out every single house from the highway. When we first approached the West Coast, I marveled at the first palm trees I’d ever seen and at how Los Angeles smelled. I hadn’t realized that a place could smell different. Often when we traveled, we stayed for a while in the communities we’d ended up in. We’d talk to locals, make friends, develop routines, meander like we meant to stay and had all the time in the world to get around to the sights. These travels with my mother across the country in a car named Betty may have been motivated more by desperation than by a sense of adventure, but they taught me so much about travel. I learned to treasure the sight of those blue rest-stop signs along the highway, and how to block out the bright rest-stop lights so you can get a passable night’s sleep in the car (and how to get a passable night’s sleep in a car). I learned how to stretch a dollar and extend the life of a tank of gas (like buying a loaf of bread instead of sandwich and keeping a cruising speed in the slow lane). I learned how to read a road map and cope with a radiator leak on an isolated stretch of highway. Most important, I learned that travel isn’t just for the jet-setting rich. It isn’t just about spring-break trips, seeing “the sights,” or checking off “Must-See” items on your to-do list. It can be that too, but it encompasses so much more. I learned that while our society tends to conflate “travel” with “vacation,” travel is really about the many and myriad ways that we move around the world. Travel can mean being the first of your family to make a new life in a new country. It can mean making a treacherous dayslong trek across a desert in search of a better life. It can mean chugging Big Gulps to stay awake while you haul goods across the country in a semitruck. It can mean military service or chasing the job market. 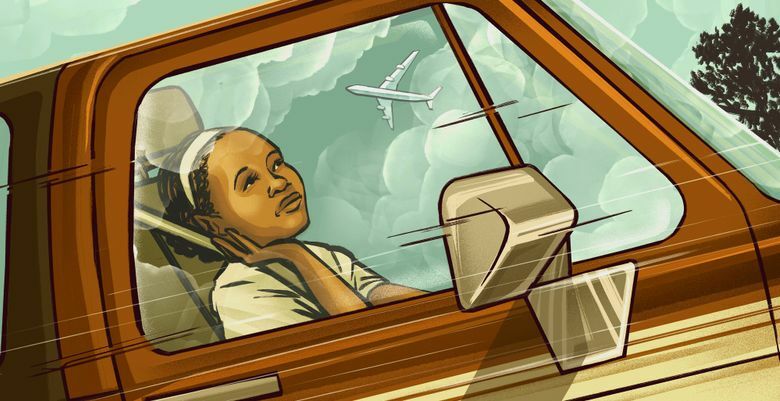 It can mean a single mother crisscrossing the country with her kids in tow, fleeing troubles that can’t be solved by mileage. It is also arriving in someone else’s home, places with troubles all their own. Not to mention that when we travel, we bring with us all of our own biases and behaviors cultivated by the homes we are coming from. When my family traveled, our truck full to the brim with our belongings, we were quite literally bringing our home with us wherever we went. Growing up this way, poor and on the road, I saw wild differences and surprising similarities between communities just a hundred miles apart, and I saw the small ways that our arrival in these places changed some things and in some ways changed us. Even if we stay in resorts designed to make us feel like we’re miles away from reality, we leave a footprint everywhere we go, for better or for worse — a carbon footprint, a contribution to economies or social dynamics, impacts on individuals, impressions about the places we come from or the demographics we represent. While the travel industry remains very much dominated by a “go here, do this” model, I try to remember these lessons from my childhood on the road and look for stories that acknowledge all the ways people move around the world.